The more "visual" face of the Demons, the Tiger Clan is in charge with defense and protection of their island. During the war, it would take 15 humans to take down a single Tiger Clan Warrior; a fact that has not been forgotten today. 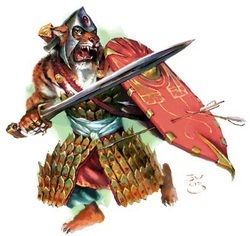 Many Tiger Clan members believe it is thier duty to the gods to make the world a better place, leaving the island on adventures and ridding the world of evil. Many of the Tiger Clan find themselves fighting alongside Dragons, Elves, and even, at times, Humans. Many of the Tiger Clan wish to one day live in peaceful coexistion with humans, something that will not happen in the forseeable future.